Tags: Alan Guth, Astronomy ( 7,548 ), Astrophysics ( 4,683 ), Basic Research ( 10,441 ), Cosmic Inflation ( 22 ), Cosmology ( 4,874 ), Ethan Siegel ( 232 ), Multiverse theory ( 20 ), Why Haven't We Bumped Into Another Universe Yet? The multiverse idea states that there are an arbitrarily large number of Universes like our own, but that doesn’t necessarily mean there’s another version of us out there, and it certainly doesn’t mean there’s any chance of running into an alternate version of yourself… or anything from another Universe at all. Lee Davy / flickr. This is not only what logic dictates, it’s what no less an authority than Roger Penrose has claimed. But Penrose — and conventional wisdom — are both wrong here. Our Universe is, and should be, isolated and alone in the Multiverse. Artist’s logarithmic scale conception of the observable universe. Note that we’re limited in how far we can see back by the amount of time that’s occurred since the hot Big Bang: 13.8 billion years, or (including the expansion of the Universe) 46 billion light years. Anyone living in our Universe, at any location, would see almost exactly the same thing from their vantage point. Wikipedia user Pablo Carlos Budassi. Although there’s a lot of hype and controversy surrounding it, there’s an extremely strong physical motivation for the existence of the Multiverse. If you combine two of our leading ideas about how the Universe works, cosmic inflation and quantum physics, it’s all but inescapable that we’ll conclude that our Universe resides in a Multiverse. Coming along for the ride is another conclusion: that every single Universe that gets created — that every hot Big Bang that ensues — is immediately and forever causally disconnected from all the others, eternally into the future. Here’s how that happens, and here’s how we know. The expanding Universe, full of galaxies and the complex structure we observe today, arose from a smaller, hotter, denser, more uniform state. But what lies outside the observable Universe, by definition, cannot be observed. C. Faucher-Giguère, A. Lidz, and L. Hernquist, Science 319, 5859 (47). Cosmic inflation came about as an add-on to the Big Bang, successfully providing a mechanism for explaining why it began with certain conditions. while simultaneously making new predictions that could be tested. These predictions included a specific spectrum for the density fluctuations the Universe was born with, a maximum temperature that the Universe achieved in the early stages of the hot Big Bang, the existence of fluctuations on scales larger than the cosmic horizon, and a particular spectrum of gravitational wave fluctuations. All of these, except the very last, have since been observationally confirmed. What cosmic inflation is, exactly, is a period prior [? *] to the Big Bang where the Universe is dominated by the energy inherent to space itself. Unlike today, where the value of dark energy is extremely small, inflation posits that it was extremely large: larger by far than even the energy density when the Universe was full of matter and radiation in the extremely hot, early stages after the Big Bang. Since the expansion was dominated by the energy inherent to space, the rate of expansion was exponential, meaning that new space was continuously and rapidly created. If the Universe doubled in size after a certain amount of time, then after ten times that amount of time passed, it’d be 210, or over 1000, times as large in all dimensions. In extremely short order, any non-flat, matter-containing region of space would become indistinguishable from flat, and would have all the matter particles inflated away so that no two would ever meet. Inflation causes space to expand exponentially, which can very quickly result in any pre-existing curved space appearing flat. E. Siegel (L); Ned Wright’s cosmology tutorial (R). On the other hand, inflation must come to an end at some point. The energy inherent to space cannot remain there forever, otherwise the Big Bang never would have occurred [? *], and the Universe as we know it would never have come to be. Somehow, that energy needs to get transferred from the fabric of space itself and dumped into matter and radiation. A nice way to visualize this is to view inflation as a field that occurs when a ball is at the top of a hill. As long as the ball remains up high, inflation, and this exponential expansion, continues. But in order for inflation to end, whatever quantum field is responsible for it has to roll from the high-energy, unstable state that drives inflation down into a low-energy, equilibrium state. That transition, and “rolling” down into the valley, is what causes inflation to come to an end, and create the hot Big Bang. When cosmic inflation occurs, the energy inherent in space is large, as it is at the top of this hill. As the ball rolls down into the valley, that energy converts into particles. E. Siegel. But here’s the kicker: what I just described is how a classical field works, but we just said that inflation has to be, like all physical fields, an inherently quantum one. Like all quantum fields, it’s described by a wavefunction, with the probability of that wave spreading out over time. If the value of the field is rolling slowly-enough down the hill, then the quantum spreading of the wavefunction will be faster than the roll, meaning that it’s possible — even probable — for inflation to wind up farther away from ending and giving rise to a Big Bang as time goes on. If inflation is a quantum field, then the field value spreads out over time, with different regions of space taking different realizations of the field value. In many regions, the field value will wind up in the bottom of the valley, ending inflation, but in many more, inflation will continue, arbitrarily far into the future. E. Siegel / Beyond The Galaxy. Because space is expanding at an exponential rate during inflation, this means that exponentially more regions of space are being created as time goes on. The thing is, inflation isn’t compelled to end everywhere at once; different regions will see the value of their quantum fields spread out by different amounts and in different directions over time! In a few regions, inflation will come to an end, as long as the field rolls down into the valley. But in others, inflation will continue on, giving rise to more and more space, where it continues to expand exponentially. Wherever inflation occurs (blue cubes), it gives rise to exponentially more regions of space with each step forward in time. Even if there are many cubes where inflation ends (red Xs), there are far more regions where inflation will continue on into the future. The fact that this never comes to an end is what makes inflation ‘eternal’ once it begins. E. Siegel / Beyond The Galaxy. This is where the phenomenon known as eternal inflation, and the idea of a multiverse, comes from. Where inflation ends, we get a hot Big Bang and a Universe — of which we can observe part of the one we’re in — very much like our own. (Denoted by the red “X” above.) But surrounding each of those regions where a hot Big Bang occurs is one where inflation doesn’t end, and the exponential expansion continues. In those regions, more inflating space is produced, driving apart the regions where inflation ended at a faster rate than they’re capable of expanding at. This gives rise to other regions that will have hot Big Bangs, but each and every one of them will be causally disconnected from our own, at the moment of the hot Big Bang and forever into the future. If you picture the Multiverse as an enormous ocean, you can picture the individual Universes where a hot Big Bang occurs as little bubbles appearing in it. The bubbles, like real air bubbles that rise from the bottom of the ocean, will expand as time goes on, just as our own Universe is expanding. But unlike the liquid water of the ocean, the “ocean” of inflating spacetime keeps on expanding at a faster rate than the bubbles themselves can ever expand. As long as the space between them continues to inflate, and inflation predicts they will for an eternity, no two bubbles should ever collide. Unlike the boiling water on your stove, the bubbles don’t percolate. It would be an enormous surprise that runs counter to inflation and quantum theory’s predictions if any two Universes ever did collide. While bubble-wall collisions might leave a telltale sign on our Universe, we’ve examined the leftover glow from the Big Bang in gory detail, and no evidence for such a collision exists. Thankfully for our most robust theories of the early Universe, this is exactly in line with what’s been predicted. The reason we don’t see evidence for our Universe colliding with another is because our Universe has never collided with another one, just as our leading theories predict. Anyone who tells you otherwise has got some serious explaining to do. I mean really, Ethan, how can you post inflation prior to the Big Bang? I have seen no one posit this before. The stars and galaxies we see today didn’t always exist, and the farther back we go, the closer to an apparent singularity the Universe gets, but there is a limit to that extrapolation. To go all the way back, we need a modification to the Big Bang: cosmological inflation. Image credit: NASA, ESA, and A. Feild (STScI). In order to be considered a scientific theory, there are three things your idea needs to do. First off, you have to reproduce all of the successes of the prior, leading theory. Second, you need to explain a new phenomenon that isn’t presently explained by the theory you’re seeking to replace. And third, you need to make a new prediction that you can then go out and test: where your new idea predicts something entirely different or novel from the pre-existing theory. Do that, and you’re science. Do it successfully, and you’re bound to become the new, leading scientific theory in your area. Many prominent physicists have recently come out against inflation, with some claiming that it isn’t even science. But the facts say otherwise. Not only is inflation science, it’s now the leading scientific theory about where our Universe comes from. The expanding Universe, full of galaxies and the complex structure we observe today, arose from a smaller, hotter, denser, more uniform state. But even that initial state had its origins, with cosmic inflation as the leading candidate for where that all came from. Image credit: C. Faucher-Giguère, A. Lidz, and L. Hernquist, Science 319, 5859 (47). The Big Bang was first confirmed in the 1960s, with the observation of the Cosmic Microwave Background [CMB]. Since that first detection of the leftover glow, predicted from an early, hot, dense state, we’ve been able to validate and confirm the Big Bang’s predictions in a number of important ways. The large-scale structure of the Universe is consistent with having formed from a nearly-uniform past state, under the influence of gravity over billions of years. The Hubble expansion and the temperature in the distant past is consistent with an expanding, cooling Universe filled with matter and energy of various types. The abundances of hydrogen, helium, lithium, and their various isotopes matches the predictions from an early, hot, dense state. And the blackbody spectrum of the Big Bang’s leftover glow matches our observations precisely. The light from the cosmic microwave background and the pattern of fluctuations from it gives us one way to measure the Universe’s curvature. To the best of our measurements, to within 1 part in about 400, the Universe is perfectly spatially flat. Image credit: Smoot Cosmology Group / Lawrence Berkeley Labs. But there are a number of things that we observe that the Big Bang doesn’t explain. The fact that the Universe is the same exact temperature in all directions, to better than 99.99%, is an observational fact without a theoretical cause. The fact that the Universe, in all directions, appears to be spatially flat (rather than positively or negatively curved), is another true fact without an explanation. And the fact that there are no leftover high-energy relics, like magnetic monopoles, is a curiosity that we wouldn’t expect if the Universe began from an arbitrarily hot, dense state. In other words, the implication is that despite all of the Big Bang’s successes, it doesn’t explain everything about the origin of the Universe. Either we can look at these unexplained phenomena and conjecture, “maybe the Universe was simply born this way,” or we can look for an explanation that meets our requirements for a scientific theory. That’s exactly what Alan Guth did in 1979, when he first stumbled upon the idea of cosmological inflation. The big idea of cosmic inflation was that the matter-and-radiation-filled Universe, the one that has been expanding and cooling for billions of years, arose from a very different state that existed prior to what we know as our observable Universe. Instead of being filled with matter-and-radiation, space was full of vacuum energy, which caused it to expand not just rapidly, but exponentially, meaning the expansion rate doesn’t fall with time as long as inflation goes on. It’s only when inflation comes to an end that this vacuum energy gets converted into matter, antimatter, and radiation, and the hot Big Bang results. 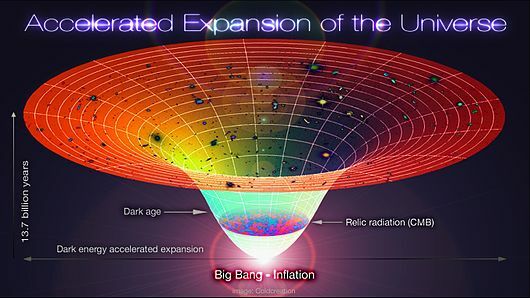 This illustration shows regions where inflation continues into the future (blue), and where it ends, giving rise to a Big Bang and a Universe like ours (red X). Note that this could go back indefinitely, and we’d never know. Image credit: E. Siegel / Beyond The Galaxy. It was generally recognized that inflation, if true, would solve those three puzzles that the Big Bang could only posit as initial conditions: the horizon (temperature), flatness (curvature), and monopole (lack-of-relics) problems. In the early-to-mid 1980s, lots of work went into meeting that first criteria: reproducing the successes of the Big Bang. The key was to arrive at an isotropic, homogeneous Universe with conditions that matched what we observed. he two simplest classes of inflationary potentials, with chaotic inflation (L) and new inflation (R) shown. Image credit: E. Siegel / Google Graph. “Chaotic inflation” models, where vacuum energy starts out high on a parabola-like potential, rolling into the valley to end inflation. The earliest stages of the Universe, before the Big Bang, are what set up the initial conditions that everything we see today has evolved from. Image credit: E. Siegel, with images derived from ESA/Planck and the DoE/NASA/ NSF interagency task force on CMB research. 1. The Universe should be nearly perfectly flat. Yes, the flatness problem was one of the original motivations for it, but at the time, we had very weak constraints. 100% of the Universe could be in matter and 0% in curvature; 5% could be matter and 95% could be curvature, or anywhere in between. Inflation, quite generically, predicted that 100% needed to be “matter plus whatever else,” but curvature should be between 0.01% and 0.0001%. This prediction has been validated by our ΛCDM model, where 5% is matter, 27% is dark matter and 68% is dark energy; curvature is constrained to be 0.25% or less. As observations continue to improve, we may, in fact, someday be able to measure the non-zero curvature predicted by inflation. 2. There should be an almost scale-invariant spectrum of fluctuations. If quantum physics is real, then the Universe should have experienced quantum fluctuations even during inflation. These fluctuations should be stretched, exponentially, across the Universe. When inflation ends, these fluctuations should get turned into matter and radiation, giving rise to overdense and underdense regions that grow into stars and galaxies, or great cosmic voids. Because of how inflation proceeds in the final stages, the fluctuations should be slightly greater on either small scales or large scales, depending on the model of inflation, which means there should be a slight departure from perfect scale invariance. If scale invariance were exact, a parameter we call n_s would equal 1; n_s is observed to be 0.96, and wasn’t measured until WMAP in the 2000s. 3. There should be fluctuations on scales larger than light could have traveled since the Big Bang. This is another consequence of inflation, but there’s no way to get a coherent set of fluctuations on large scales like this without something stretching them across cosmic distances. The fact that we see these fluctuations in the cosmic microwave background and in the large-scale structure of the Universe — and didn’t know about them until the COBE and WMAP satellites in the 1990s and 2000s — further validates inflation. 4. These quantum fluctuations, which translate into density fluctuations, should be adiabatic. Fluctuations could have come in different types: adiabatic, isocurvature, or a mixture of the two. Inflation predicted that these fluctuations should have been 100% adiabatic, which should leave unique signatures in both the cosmic microwave background and the Universe’s large-scale structure. Observations bear out that yes, in fact, the fluctuations were adiabatic: of constant entropy everywhere. 5. There should be an upper limit, smaller than the Planck scale, to the temperature of the Universe in the distant past. This is also a signature that shows up in the cosmic microwave background: how high a temperature the Universe reached at its hottest. Remember, if there were no inflation, the Universe should have gone up to arbitrarily high temperatures at early times, approaching a singularity. But with inflation, there’s a maximum temperature that must be at energies lower than the Planck scale (~10^19 GeV). What we see, from our observations, is that the Universe achieved temperatures no higher than about 0.1% of that (~10^16 GeV) at any point, further confirming inflation. This is an even better solution to the monopole problem than the one initially envisioned by Guth. 6. And finally, there should be a set of primordial gravitational waves, with a particular spectrum. Just as we had an almost perfectly scale-invariant spectrum of density fluctuations, inflation predicts a spectrum of tensor fluctuations in General Relativity, which translate into gravitational waves. The magnitude of these fluctuations are model-dependent on inflation, but the spectrum has a set of unique predictions. This sixth prediction is the only one that has not been verified observationally in any way. The contribution of gravitational waves left over from inflation to the B-mode polarization of the Cosmic Microwave background has a known shape, but its amplitude is dependent on the specific model of inflation. These B-modes from gravitational waves from inflation have not yet been observed. Image credit: Planck science team. On all three counts — of reproducing the successes of the non-inflationary Big Bang, of explaining observations that the Big Bang cannot, and of making new predictions that can be (and, in large number, have been) verified — inflation undoubtedly succeeds as science. It does so in a way that other theories which only give rise to non-observable predictions, such as string theory, does not. Yes, when critics talk about inflation and mention a huge amount of model-building, that is a problem; inflation is a theory in search of a single, unique, definitive model. It’s true that you can contrive as complex a model as you want, and it’s virtually impossible to rule them out. A variety of inflationary models and the scalar and tensor fluctuations predicted by cosmic inflation. Note that the observational constraints leave a huge variety of inflationary models as still valid. Image credit: Kamionkowski and Kovetz, ARAA, 2016, via http://lanl.arxiv.org/abs/1510.06042. But that is not a flaw inherent to the theory of inflation; it is an indicator that we don’t yet know enough about the mechanics of inflation to discern which models have the features our Universe requires. It is an indicator that the inflationary paradigm itself has limits to its predictive power, and that a further advance will be necessary to move the needle forward. But simply because inflation isn’t the ultimate answer to everything doesn’t mean it isn’t science. Rather, it’s exactly in line with what science has always shown itself to be: humanity’s best toolkit for understanding the Universe, one incremental improvement at a time. Measuring tiny variations in the cosmic microwave background will enable major discoveries about the origin of the universe. How is it possible to know in detail about things that happened nearly 14 billion years ago? The answer, remarkably, could come from new measurements of the cosmic microwave radiation that today permeates all space, but which was emitted shortly after the universe was formed. Previous measurements of the microwave background showed that the early universe was remarkably uniform, but not perfectly so: There are small variations in the intensity (or temperature) and polarization of the background radiation. These faint patterns show close agreement with predictions from what is now the standard theoretical model of how the universe began. That model describes an extremely energetic event—the Big Bang—followed within a tiny fraction of a second by a period of very accelerated expansion of the universe called cosmic inflation. During this expansion, small quantum fluctuations were stretched to astrophysical scales, becoming the seeds that gave rise to the galaxies and other large-scale structures of the universe visible today. After the cosmic inflation ended, the expansion began to slow and the primordial plasma of radiation and high-energy sub-atomic particles began to cool. Within a few hundred thousand years, the plasma had cooled sufficiently for atoms to form, for the universe to become transparent to light, and for the first light to be released. That first light has since been shifted—its wavelengths stretched 1,000-fold into the microwave spectrum by the continuing expansion of the universe—and is what we now measure as the microwave background [see above]. 1. 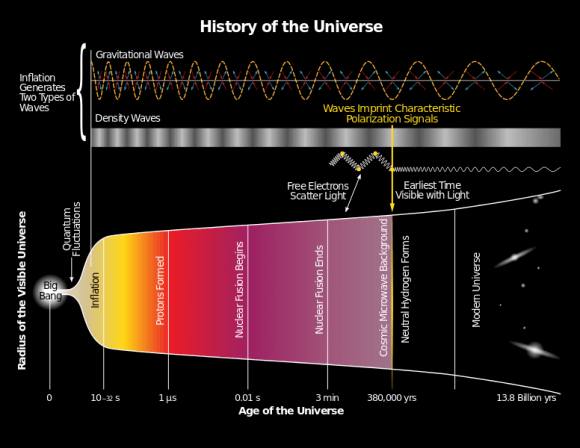 The accelerated expansion of the universe in the first fraction of a second of its existence, as described by the inflation model, would have created a sea of gravitational waves. These distortions in spacetime would in turn would have left a distinct pattern in the polarization of the microwave background. Detecting that pattern would thus provide a key test of the inflation model, because the level of the polarization links directly to the time of inflation and its energy scale. 2. Investigating the cosmic gravitational wave background would build on the stunning recent discovery of gravity waves, apparently from colliding black holes, helping to further the new field of gravitational wave astronomy. 3. These investigations would provide a valuable window on physics at unimaginably high energy scales, a trillion times more energetic than the reach of the most powerful Earth-based accelerators. 4. The cosmic microwave background provides a backlight on all structure in the universe. Its precise measurement will illuminate the evolution of the universe to the present day, allowing unprecedented insights and constraints on its still mysterious contents and the laws that govern them. The origin of the universe was a fantastic event. To gain an understanding of that beginning as an inconceivably small speck of spacetime and its subsequent evolution is central to unraveling continuing mysteries such as dark matter and dark energy. It can shed light on how the two great theories of general relativity and quantum mechanics relate to each other. And it can help us gain a clearer perspective on our human place within the universe. That is the opportunity that a new generation of telescopes and detectors can unlock. Figure 1Ultra-sensitive superconducting bolometer detectors manufactured with thin-film techniques. The project proposes to deploy 500,000 such detectors. Chrystian Posada Arbelaez. The time for the next generation cosmic microwave background experiment is now. Transformational improvements have been made in both the sensitivity of microwave detectors and the ability to manufacture them in large numbers at low cost. The advance stems from the development of ultra-sensitive superconducting detectors called bolometers. These devices (Figure 1) essentially eliminate thermal noise by operating at a temperature close to absolute zero, but also are designed to make sophisticated use of electrothermal feedback—adjusting the current to the detectors when incoming radiation deposits energy, so as to keep the detector at its critical superconducting transition temperature under all operating conditions. The sensitivity of these detectors is limited only by the noise of the incoming signal—they generate an insignificant amount of noise of their own. Equally important are the production advances. These new ultra-sensitive detectors are manufactured with thin film techniques adapted from Silicon Valley—although using exotic superconducting materials—so that they can be rapidly and uniformly produced at greatly reduced cost. That’s important, because the proposed project needs to deploy about 500,000 detectors in all—something that would not be possible with hand-assembled devices as in the past. Moreover, the manufacturing techniques allow these sophisticated detectors to automatically filter the incoming signals for the desired wavelength sensitivity. 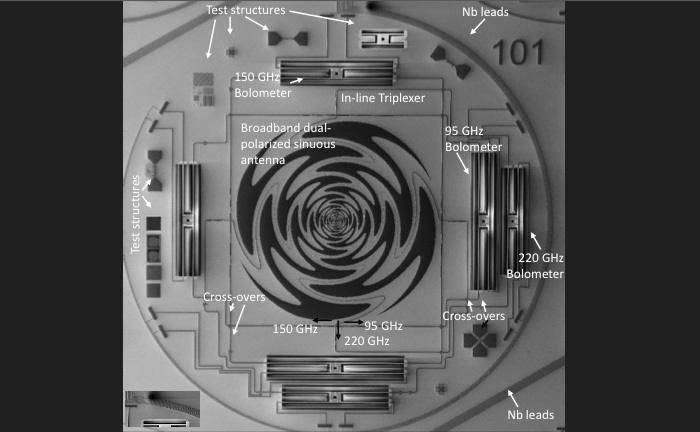 Figure 2The current focal plane on the South Pole Telescope with seven wafers of detectors plus hand-assembled individual detectors. 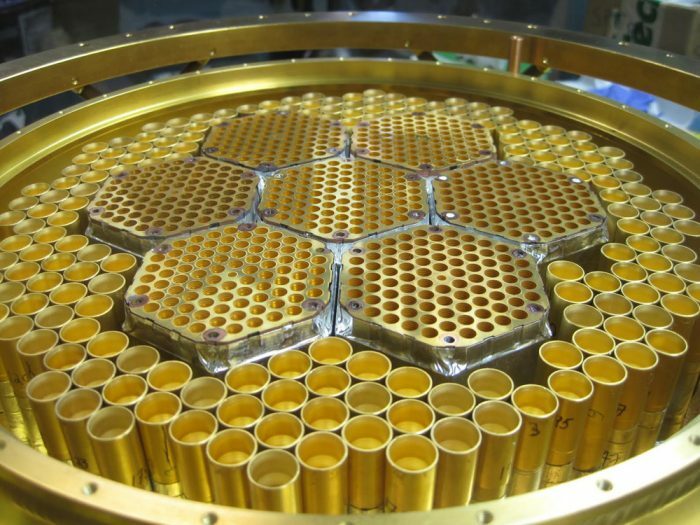 A single detector wafer of the advanced design proposed here would provide more sensitivity and frequency coverage than this entire focal plane; the project would deploy several hundred such wafers across 10 or more telescopes. Jason Henning. To deploy the detectors, new telescopes are needed that have a wide enough focal plane to accommodate a large number of detectors—about 10,000 per telescope to capture enough incoming photons and see a wide enough area of the sky (Figure 2). They need to be placed at high altitude, exceedingly dry locations, so as to minimize the water vapor in the atmosphere that interferes with the incoming photons. The plan is to build on the two sites already established for ongoing background observations, the high Antarctic plateau at the geographic South Pole, and the high Atacama plateau in Chile. Discussions are underway with the Chinese about developing a site in Tibet; Greenland is also under consideration. In all, about 10 specialized telescopes will be needed, and will need to operate for roughly 5 years to accomplish the scientific goals described above. Equally important, the science teams that have come together to do this project will need significant upgrades to their fabrication and testing capabilities. The resources needed to accomplish this project are estimated at $100 million over 10 years, in addition to continuation of current federal funding. The technology is already proven and the upgrade path understood. Equally important, a cadre of young, enthusiastic, and well-trained scientists are eager to move forward. Unfortunately, constraints on the federal funding situation are already putting enormous stress on the ability of existing teams just to continue, and the expanded resources to accomplish the objectives described above are not available. This is thus an extraordinary opportunity for private philanthropy—an opportunity to “see” back in time to the very beginning of the universe and to understand the phenomena that shaped our world. The earliest stages of the Universe, before the Big Bang, are what set up the initial conditions that everything we see today has evolved from. E. Siegel, with images derived from ESA/Planck and the DoE/NASA/ NSF interagency task force on CMB research. In February, a group of theorists, including one of inflation’s co-founders, claimed that inflation had failed. 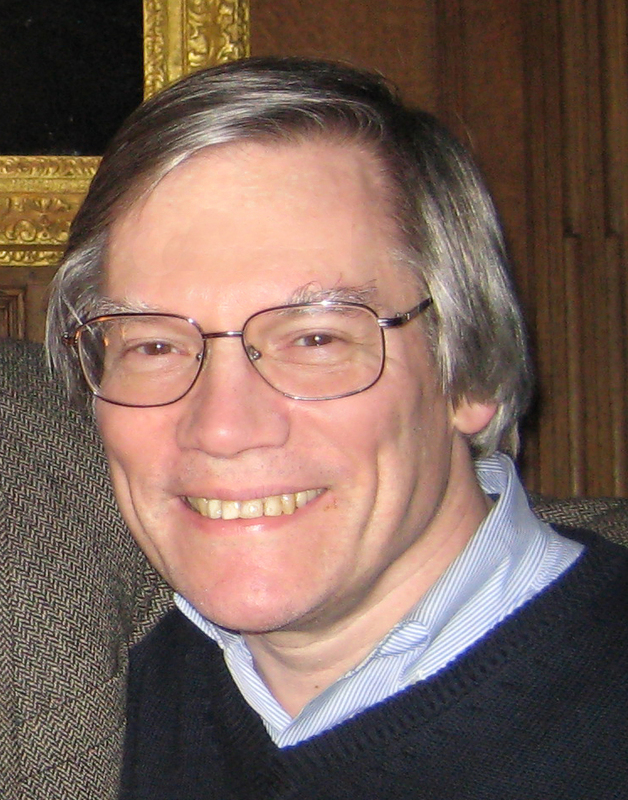 The mainstream group of inflationary cosmologists, including inflation’s inventor, Alan Guth, wrote a rebuttal. This prompted the original group to dig in further, denouncing the rebuttal. And earlier this week, a major publication and one of the rebuttal’s co-signers highlighted and gave their perspective on the debate. There are three things going on here: the problems with the Big Bang that led to the development of cosmic inflation, the solution(s) that cosmic inflation provides and generic behavior, and subsequent developments, consequences, and difficulties with the idea. Is that enough to cast doubt on the entire enterprise? Let’s lay it all out for you to see. Ever since we first recognized that there are galaxies beyond our own Milky Way, all the indications have shown us that our Universe is expanding. Because the wavelength of light is what determines its energy and temperature, then the fabric of expanding space stretches those wavelengths to be longer, causing the Universe to cool. If the Universe is expanding and cooling as we head into the future, then that means it was closer together, denser, and hotter in the past. As we extrapolate farther and farther back, the hot, dense, uniform Universe tells us a story about its past. We arrive at a point where galaxy clusters, individual galaxies or even stars haven’t had time to form due to the influence of gravity. We can go even earlier, where the amount of energy in particles and radiation make it impossible for neutral atoms to form; they’d immediately be blasted apart. Even earlier, and atomic nuclei are blasted apart, preventing anything more complex than a proton or neutron from forming. Even earlier, and we begin creating matter/antimatter pairs spontaneously, due to the high energies present. And if you go all the way back, as far as your equations can take you, you’d arrive at a singularity, where all the matter and energy in the entire Universe were condensed into a single point: a singular event in spacetime. That was the original idea of the Big Bang. If that were the way things worked, there would be a number of puzzles based on the observations we had. Why would the Universe be the same temperature everywhere? The different regions of space from different directions wouldn’t have had time to exchange information and thermalize; there’s no reason for them to be the same temperature. Yet the Universe, everywhere we looked, had the same background 2.73 K temperature. Why would the Universe be perfectly spatially flat? The expansion rate and the energy density are two completely independent quantities, yet they must be equal to one part in 1024 in order to produce the flat Universe we have today. Why are there no leftover high-energy relics, as practically every high-energy theory predicts? There are no magnetic monopoles, no heavy, right-handed neutrinos, no relics from grand unification, etc. Why not? In 1979, Alan Guth had the idea that an early phase of exponential expansion preceding the hot Big Bang could solve all of these problems, and would make additional predictions about the Universe that we could go and look for. This was the big idea of cosmic inflation. The Universe is the same temperature everywhere today because disparate, distant regions were once connected in the distant past, before the exponential expansion drove them apart. The Universe is flat because inflation stretched it to be indistinguishable from flat; the part of the Universe that’s observable to us is so small relative to how much inflation stretched it that it’s unlikely to be any other way. And the reason there are no high-energy relics is because inflation pushed them away via the exponential expansion, and then when inflation ended and the Universe got hot again, it never achieved the ultra-high temperatures necessary to create them again. By the early 1980s, not only did inflation solve those puzzles, but we also began coming up with models that successfully recovered a Universe that was isotropic (the same in all directions) and homogeneous (the same in all location), consistent with all our observations. The Universe should be perfectly flat. Yes, that was one of the original motivations for it, but at the time, we had very weak constraints. 100% of the Universe could be in matter and 0% in curvature; 5% could be matter and 95% could be curvature, or anywhere in between. Inflation, quite generically, predicted that 100% needed to be “matter plus whatever else,” but curvature should be 0%. This prediction has been validated by our ΛCDM model, where 5% is matter, 27% is dark matter and 68% is dark energy; curvature is still 0%. There should be an almost scale-invariant spectrum of fluctuations. If quantum physics is real, then the Universe should have experienced quantum fluctuations even during inflation. These fluctuations should be stretched, exponentially, across the Universe. When inflation ends, these fluctuations should get turned into matter and radiation, giving rise to overdense and underdense regions that grow into stars and galaxies, or great cosmic voids. Because of how inflation proceeds in the final stages, the fluctuations should be slightly greater on either small scales or large scales, depending on the model of inflation. For perfect scale invariance, a parameter we call n_s would equal 1 exactly; n_s is observed to be 0.96. There should be fluctuations on scales larger than light could have traveled since the Big Bang. This is another consequence of inflation, but there’s no way to get a coherent set of fluctuations on large scales like this without something stretching them across cosmic distances. The fact that we see these fluctuations in the cosmic microwave background and in the large-scale structure of the Universe — and didn’t know about them in the early 1980s — further validates inflation. These quantum fluctuations, which translate into density fluctuations, should be adiabatic. Fluctuations could have come in different types: adiabatic, isocurvature, or a mixture of the two. Inflation predicted that these fluctuations should have been 100% adiabatic, which should leave unique signatures in both the cosmic microwave background and the Universe’s large-scale structure. Observations bear out that yes, in fact, the fluctuations were adiabatic: of constant entropy everywhere. There should be an upper limit, smaller than the Planck scale, to the temperature of the Universe in the distant past. This is also a signature that shows up in the cosmic microwave background: how high a temperature the Universe reached at its hottest. Remember, if there were no inflation, the Universe should have gone up to arbitrarily high temperatures at early times, approaching a singularity. But with inflation, there’s a maximum temperature that must be at energies lower than the Planck scale (~1019 GeV). What we see, from our observations, is that the Universe achieved temperatures no higher than about 0.1% of that (~1016 GeV) at any point, further confirming inflation. And finally, there should be a set of primordial gravitational waves, with a particular spectrum. Just as we had an almost perfectly scale-invariant spectrum of density fluctuations, inflation predicts a spectrum of tensor fluctuations in General Relativity, which translate into gravitational waves. The magnitude of these fluctuations are model-dependent on inflation, but the spectrum has a set of unique predictions. This sixth prediction is the only one that has not been verified observationally. So inflation has a tremendous number of successes to its name. But since the late 1980s, theorists have spent a lot of time cooking up a variety of inflationary models. They’ve found some incredibly odd, non-generic behavior in some of them, including exceptions that break some of the predictive rules, above. In general, the simplest inflationary models are based on a potential: you draw a line with a trough or well at the bottom, the inflationary field starts off at some point away from that bottom, and it slowly rolls down towards the bottom, resulting in inflation until it settles at its minimum. Quantum effects play a role in the field, but eventually, inflation ends, converting that field energy into matter and radiation, resulting in the Big Bang. But you can make multi-field models, fast-roll models instead of slow-roll models, contrived models that have large departures from flatness, and so on. In other words, if you can make the models as complex as you want, you can find one that gives departures from the generic behavior described above, sometimes even resulting in departures from one or more of these six predictions. The fluctuations in the CMB are based on primordial fluctuations produced by inflation. In particular, the ‘flat part’ on large scales (at left) have no explanation without inflation. NASA / WMAP Science Team. This is what the current controversy is all about! One side goes so far as to claim that because you can contrive models that can give you almost arbitrary behavior, inflation fails to rise to the standard of a scientific theory. The other side claims that inflation makes these generic, successful predictions, and that the better we measure these parameters of the Universe, the more we constrain which models are viable, and the closer we come to understanding which one(s) best describe our physical reality. The shape of gravitational wave fluctuations is indisputable from inflation, but the magnitude of the spectrum is entirely model-dependent. Measuring this will put the debate over inflation to rest, but if the magnitude is too low to be detected over the next 25 years or so, the argument may never be settled. Planck science team. The facts that no one disputes are that without inflation, or something else that’s very much like inflation (stretching the Universe flat, preventing it from reaching high energies, creating the density fluctuations we see today, causing the Universe to begin at the same temperatures everywhere, etc. ), there’s no explanation for the initial conditions the Universe starts off with. Alternatives to inflation have that hurdle to overcome, and right now there is no alternative that has displayed the same predictive power that the inflationary paradigm brings. That doesn’t mean that inflation is necessarily right, but there sure is a lot of good evidence for it, and many of the “possible” models that can be concocted have already been ruled out. Until an alternative model can achieve all of inflation’s successes, cosmic inflation will remain the leading idea for where our hot Big Bang came from. The theoretical physicist discusses the expanding universe and the infinite possibilities it brings. Buried under a mountain of papers and empty Coke Zero bottles, Alan Guth ponders the origins of the cosmos. A world-renowned theoretical physicist and professor at the Massachusetts Institute of Technology, Guth is best known for pioneering the theory of cosmic inflation, a model that explains the exponential growth of the universe mere fractions of a second after the Big Bang, and its continued expansion today. Cosmic inflation not only describes the underlying physics of the Big Bang, however. Guth believes it also supports the idea that our universe is one of many, with even more universes yet to form. Science Friday headed to MIT (where this writer also works, but in a different department) to chat with Guth in his office about the infinite possibilities in an unending cosmos, and the fortune cookie that changed his life. Science Friday: What made you realize that you wanted to be a scientist? Alan Guth: I remember an event in high school, which maybe is indicative of my desires to be a theoretical physicist in particular. I was taking high school physics, and a friend of mine was doing an experiment which consisted of taking a yard stick and punching holes in it in different places and pivoting it on these different holes and seeing how the period depended on where the hole was. At this point, I had just learned enough basic physics and calculus to be able to calculate what the answer to that question is supposed to be. I remember one afternoon, we got together and compared my formula with his data using a slide rule to do the calculations. It actually worked. I was very excited about the idea that we can really calculate things, and they actually do reflect the way the real world works. You did your dissertation on particle physics and have said that it didn’t turn out exactly how you wanted. Could you tell me about that? My dissertation was about the quark model and about how quarks and anti-quarks could bind to form mesons. But it was really just before the theory of quarks underwent a major revolution [when physicists went from believing that quarks are heavy particles that have a large binding energy when they combine, to the quantum chromodynamics theory that quarks are actually very light and their binding energy [gluons] increases as they’re pulled farther apart]. I was on the wrong side of that revolution. My thesis, more or less, became totally obsolete about the time I wrote it. I certainly learned a lot by doing it. What got you into cosmology? I didn’t know about grand unified theories at the time, so he had to teach me, which he did, very successfully. Then I knew enough to put two and two together and conclude—as I’m sure many people did around the world—that yes, grand unified theories do predict that magnetic monopoles should exist, but that they would be outrageously heavy. They would weigh something like 10 to the 16th power times as much as a proton [which means that scientists should theoretically be able to observe them in the universe, although no one has yet]. About six months later, there was a visit to Cornell by [Nobel laureate] Steve Weinberg, who’s a fabulous physicist and someone I had known from my graduate student days at MIT. He was working on how grand unified theories might explain the excess of matter over anti-matter [in the universe], but it involved the same basic physics that determining how many monopoles existed in the early universe would involve. I decided that if it was sensible enough for Steve Weinberg to work on, why not me, too? After a little while, Henry Tye and I came to the conclusion that far too many magnetic monopoles would be produced if one combined conventional cosmology with conventional grand unified theories. We were scooped in publishing that, but Henry and I decided that we would continue to try to figure out if there was anything that could be changed that maybe would make it possible for grand unified theories to be consistent with cosmology as we know it. How did you come up with the idea of cosmic inflation? A little bit before I started talking to Henry Tye about monopoles, there was a lecture at Cornell by Bob Dicke, a Princeton physicist and cosmologist, in which he presented something that was called the flatness problem, a problem about the expansion rate of the early universe and how precisely fine-tuned it had to be for the universe to work to produce a universe like the one we live in [that is, one that has little or no space-time curvature and is therefore almost perfectly “flat”]. In this talk, Bob Dicke told us that if you thought about the universe at one second after the beginning, the expansion rate really had to be just right to 15 decimal places, or else the universe would either fly apart too fast for any structure to form or re-collapse too fast for any structure to form. At the time, I thought that was kind of amazing but didn’t even understand it. But after working on this magnetic monopole question for six months, I came to the realization one night that the kind of mechanism that we were thinking about that would suppress the amount of magnetic monopoles produced after the Big Bang [the “mechanism” being a phase transition that occurs after a large amount of super-cooling] would have the surprising effect of driving the universe into a period of exponential expansion—which is what we now call inflation—and that exponential expansion would solve this flatness problem. It would also draw the universe to exactly the right expansion rate that the Big Bang required [to create a universe like ours]. You’ve said in previous talks that a fortune cookie played a legitimately important part in your career. How so? During the spring of 1980, after having come up with this idea of inflation, I decided that the best way to publicize it would be to give a lot of talks about it. I visited MIT, but MIT had not advertised any positions that year. During the very last day of this six-week trip, I was at the University of Maryland, and they took me out for a Chinese dinner, and the fortune I got in my Chinese fortune cookie said, “An exciting opportunity awaits you if you’re not too timid.” I thought about that and decided that it might be trying to tell me something. When I got back to California, I called one of the faculty members at MIT and said in some stammering way that I hadn’t applied for any jobs because there weren’t any jobs at MIT, but I wanted to tell them that if they might be interested in me, I’d be interested in coming. Then they got back to me in one day and made me an offer. It was great. I came to MIT as a faculty member, and I’ve been here ever since. When and where do you do your best work? I firmly believe that I do my best thinking in the middle of the night. I very much like to be able to have reasonably long periods of time, a few hours, when I can concentrate on something and not be interrupted, and that only happens at night. What often happens is I fall asleep at like 9:30 and wake up at 1 or 2 and start working and then fall asleep again at 5.
Who is a dream collaborator you’d love to work with? I bet it would have been a lot of fun to work with [Albert] Einstein. What I really respect about Einstein is his desire to throw aside all conventional modes and just concentrate on what seems to be the closest we can get to an accurate theory of nature. The most concrete project I’m working on is a project in collaboration with a fairly large group here at MIT in which we’re trying to calculate the production of primordial black holes that might have happened with a certain version of inflation. If this works out, these primordial black holes could perhaps be the seeds for the super massive black holes in the centers of galaxies, which are very hard to explain. It would be incredibly exciting if that turns out to be the case. What else are you mulling over? A bigger question, which has been in the back of my mind for a decade, is the problem of understanding probabilities in eternally inflating universes. In an eternally inflating universe, these pocket universes [like the one we live in] go on being formed literally forever. An infinite number of pocket universes are formed, and that means that anything that’s physically allowed will ultimately happen an infinite number of times. Normally we interpret probabilities as relative occurrences. We think one-headed cows are more probable than two-headed cows because we think there are a lot more one-headed cows than two-headed cows. I don’t know if there are any two-headed cows on earth, but let’s pretend there are. In an eternally inflating universe, assuming that a two-headed cow is at least possible, there will be an infinite number of two-headed cows and an infinite number of one-headed cows. It’s hard to know what you mean if you try to say that one is more common than the other. If anything can happen in an eternally inflating universe, is there a situation in which I am the cosmologist and you are the journalist? [Laughs] Probably, yes. I think what we would know for sure is that anything that’s physically possible—and I don’t see why this is not physically possible—will happen an infinite number of times. For 25 years we’ve introduced top scientists to public radio listeners, and reminded them how much fun it is to learn something new. But we’re more than just a radio show. We produce award-winning digital videos, original web articles, and educational resources for teachers and informal educators. We like to say we’re brain fun, for curious people. All of our work is independently produced by the Science Friday Initiative, a non-profit organization dedicated to increasing the public’s access to science and scientific information. Public Radio International (PRI) distributes our radio show, which you can catch on public radio stations across the U.S.
Space dust accounts for at least some of the possible signal of cosmic inflation the BICEP2 experiment announced in March. How much remains to be seen. Space is full of dust, according to a new analysis from the European Space Agency’s Planck experiment. That includes the area of space studied by the BICEP2 experiment, which in March announced seeing a faint pattern left over from the big bang that could tell us about the first moments after the birth of the universe. The Planck analysis, which started before March, was not meant as a direct check of the BICEP2 result. It does, however, reveal that the level of dust in the area BICEP2 scientists studied is both significant and higher than they thought. BICEP2 scientists study the cosmic microwave background, a uniform bath of radiation permeating the universe that formed when the universe first cooled enough after the big bang to be transparent to light. BICEP2 scientists found a pattern within the cosmic microwave background, one that would indicate that not long after the big bang, the universe went through a period of exponential expansion called cosmic inflation. The BICEP2 result was announced as the first direct evidence of this process. The problem is that the same pattern, called B-mode polarization, also appears in space dust. The BICEP2 team subtracted the then known influence of the dust from their result. But based on today’s Planck result, they didn’t manage to scrub all of it. How much the dust influenced the BICEP2 result remains to be seen. In November, Planck scientists will release their own analysis of B-mode polarization in the cosmic microwave background, in addition to a joint analysis with BICEP2 specifically intended to check the BICEP2 result. These results could answer the question of whether BICEP2 really saw evidence of cosmic inflation. In 1978 Alan Guth heard about the “flatness problem” of the universe while attending a talk on cosmology—a field he was only marginally curious about. A year later, Guth found a solution. At the beginning of the big bang, for an incredibly small fraction of a second, the universe could have expanded exponentially fast, rapidly transforming curved space into flat one. Quickly running out of energy, the expansion would slow down, eventually reaching today’s sluggish pace. Such an initial explosive rush, which Guth later called inflation, could solve a number of cosmic paradoxes (see Growth of Inflation). Although scientists still debate the driving force behind inflation—Guth soon realized his original idea of “supercooling” wouldn’t work—the concept of inflation has become the leading theme and the crux of modern cosmology. 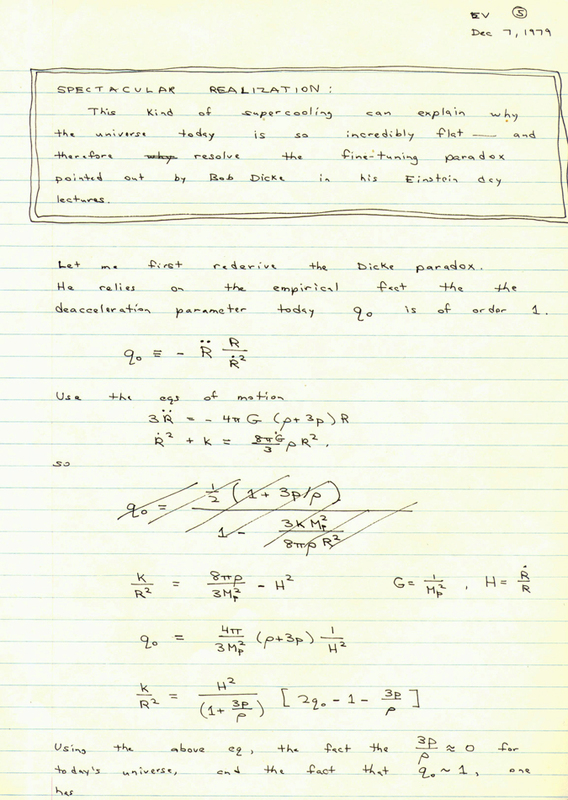 Guth’s notebook is now part of a permanent exhibit at the Adler Planetarium and Astronomy Museum in Chicago. Earlier this week, scientists announced that a telescope observing faint echoes of the so-called “Big Bang” had found evidence of the universe’s nearly instantaneous expansion from a mere dot into a dense ball containing more than 1090 particles. 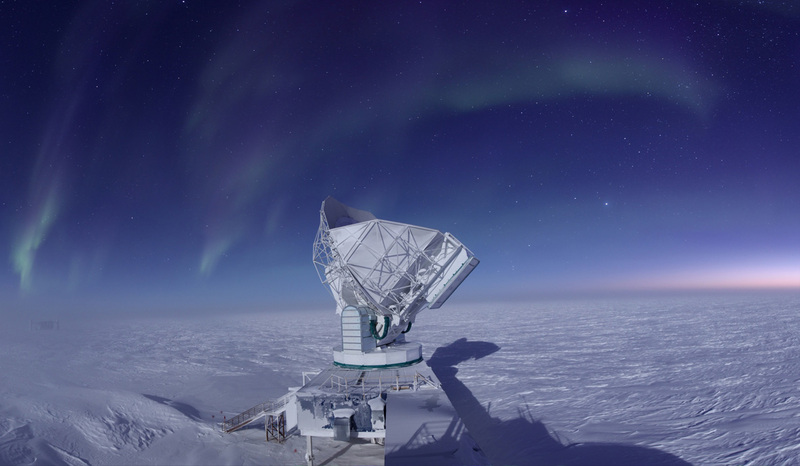 This discovery, using the BICEP2 telescope at the South Pole, provides the first strong evidence of “cosmic inflation” at the birth of our universe, when it expanded billions of times over. The theory of cosmic inflation was first proposed in 1980 by Alan Guth, now the Victor F. Weisskopf Professor of Physics at MIT. Inflation has become a cornerstone of Big Bang cosmology, but until now it had remained a theory without experimental support. 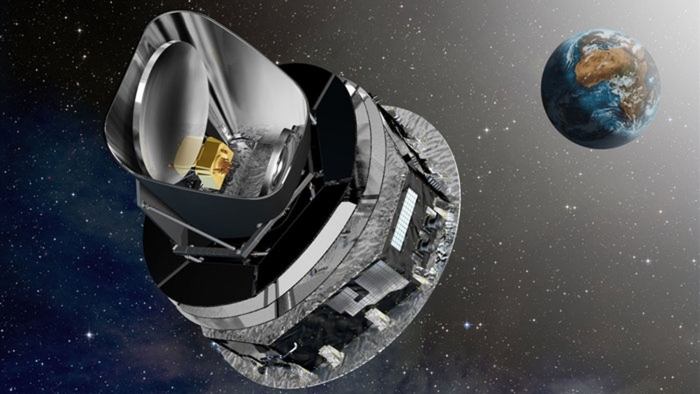 Guth discussed the significance of the new BICEP2 results with MIT News. Q: Can you explain the theory of cosmic inflation that you first put forth in 1980? A: I usually describe inflation as a theory of the “bang” of the Big Bang: It describes the propulsion mechanism that drove the universe into the period of tremendous expansion that we call the Big Bang. In its original form, the Big Bang theory never was a theory of the bang. It said nothing about what banged, why it banged, or what happened before it banged. The original Big Bang theory was really a theory of the aftermath of the bang. The universe was already hot and dense, and already expanding at a fantastic rate. The theory described how the universe was cooled by the expansion, and how the expansion was slowed by the attractive force of gravity. Inflation proposes that the expansion of the universe was driven by a repulsive form of gravity. According to [Isaac] Newton, gravity is a purely attractive force, but this changed with [Albert] Einstein and the discovery of general relativity. General relativity describes gravity as a distortion of spacetime, and allows for the possibility of repulsive gravity. Modern particle theories strongly suggest that at very high energies, there should exist forms of matter that create repulsive gravity. Inflation, in turn, proposes that at least a very small patch of the early universe was filled with this repulsive-gravity material. The initial patch could have been incredibly small, perhaps as small as 10-24 centimeter, about 100 billion times smaller than a single proton. The small patch would then start to exponentially expand under the influence of the repulsive gravity, doubling in size approximately every 10-37 second. To successfully describe our visible universe, the region would need to undergo at least 80 doublings, increasing its size to about 1 centimeter. It could have undergone significantly more doublings, but at least this number is needed. During the period of exponential expansion, any ordinary material would thin out, with the density diminishing to almost nothing. The behavior in this case, however, is very different: The repulsive-gravity material actually maintains a constant density as it expands, no matter how much it expands! While this appears to be a blatant violation of the principle of the conservation of energy, it is actually perfectly consistent. This loophole hinges on a peculiar feature of gravity: The energy of a gravitational field is negative. As the patch expands at constant density, more and more energy, in the form of matter, is created. But at the same time, more and more negative energy appears in the form of the gravitational field that is filling the region. The total energy remains constant, as it must, and therefore remains very small. It is possible that the total energy of the entire universe is exactly zero, with the positive energy of matter completely canceled by the negative energy of gravity. I often say that the universe is the ultimate free lunch, since it actually requires no energy to produce a universe. At some point the inflation ends because the repulsive-gravity material becomes metastable. The repulsive-gravity material decays into ordinary particles, producing a very hot soup of particles that form the starting point of the conventional Big Bang. At this point the repulsive gravity turns off, but the region continues to expand in a coasting pattern for billions of years to come. Thus, inflation is a prequel to the era that cosmologists call the Big Bang, although it of course occurred after the origin of the universe, which is often also called the Big Bang. Q: What is the new result announced this week, and how does it provide critical support for your theory? A: The stretching effect caused by the fantastic expansion of inflation tends to smooth things out — which is great for cosmology, because an ordinary explosion would presumably have left the universe very splotchy and irregular. The early universe, as we can see from the afterglow of the cosmic microwave background (CMB) radiation, was incredibly uniform, with a mass density that was constant to about one part in 100,000. The tiny nonuniformities that did exist were then amplified by gravity: In places where the mass density was slightly higher than average, a stronger-than-average gravitational field was created, which pulled in still more matter, creating a yet stronger gravitational field. But to have structure form at all, there needed to be small nonuniformities at the end of inflation. In inflationary models, these nonuniformities — which later produce stars, galaxies, and all the structure of the universe — are attributed to quantum theory. Quantum field theory implies that, on very short distance scales, everything is in a state of constant agitation. If we observed empty space with a hypothetical, and powerful, magnifying glass, we would see the electric and magnetic fields undergoing wild oscillations, with even electrons and positrons popping out of the vacuum and then rapidly disappearing. The effect of inflation, with its fantastic expansion, is to stretch these quantum fluctuations to macroscopic proportions. The temperature nonuniformities in the cosmic microwave background were first measured in 1992 by the COBE satellite, and have since been measured with greater and greater precision by a long and spectacular series of ground-based, balloon-based, and satellite experiments. They have agreed very well with the predictions of inflation. These results, however, have not generally been seen as proof of inflation, in part because it is not clear that inflation is the only possible way that these fluctuations could have been produced. The stretching effect of inflation, however, also acts on the geometry of space itself, which according to general relativity is flexible. Space can be compressed, stretched, or even twisted. The geometry of space also fluctuates on small scales, due to the physics of quantum theory, and inflation also stretches these fluctuations, producing gravity waves in the early universe. The new result, by John Kovac and the BICEP2 collaboration, is a measurement of these gravity waves, at a very high level of confidence. They do not see the gravity waves directly, but instead they have constructed a very detailed map of the polarization of the CMB in a patch of the sky. They have observed a swirling pattern in the polarization (called “B modes”) that can be created only by gravity waves in the early universe, or by the gravitational lensing effect of matter in the late universe. But the primordial gravity waves can be separated, because they tend to be on larger angular scales, so the BICEP2 team has decisively isolated their contribution. This is the first time that even a hint of these primordial gravity waves has been detected, and it is also the first time that any quantum properties of gravity have been directly observed. Q: How would you describe the significance of these new findings, and your reaction to them? A: The significance of these new findings is enormous. First of all, they help tremendously in confirming the picture of inflation. As far as we know, there is nothing other than inflation that can produce these gravity waves. Second, it tells us a lot about the details of inflation that we did not already know. In particular, it determines the energy density of the universe at the time of inflation, which is something that previously had a wide range of possibilities. By determining the energy density of the universe at the time of inflation, the new result also tells us a lot about which detailed versions of inflation are still viable, and which are no longer viable. The current result is not by itself conclusive, but it points in the direction of the very simplest inflationary models that can be constructed. Finally, and perhaps most importantly, the new result is not the final story, but is more like the opening of a new window. 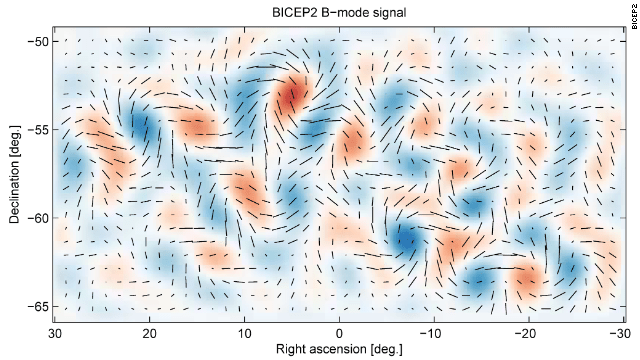 Now that these B modes have been found, the BICEP2 collaboration and many other groups will continue to study them. They provide a new tool to study the behavior of the early universe, including the process of inflation. When I (and others) started working on the effect of quantum fluctuations in the early 1980s, I never thought that anybody would ever be able to measure these effects. To me it was really just a game, to see if my colleagues and I could agree on what the fluctuations would theoretically look like. So I am just astounded by the progress that astronomers have made in measuring these minute effects, and particularly by the new result of the BICEP2 team. Like all experimental results, we should wait for it to be confirmed by other groups before taking it as truth, but the group seems to have been very careful, and the result is very clean, so I think it is very likely that it will hold up.